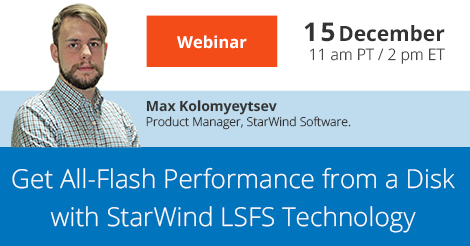 Speaker: Max Kolomyeytsev, Product Manager, StarWind Software. It's common to think that the only way to get high-performance storage is an all-flash array. However, those are real budget-killers. Is there another way to achieve the desired performance without breaking the bank? As a matter of fact, there is. 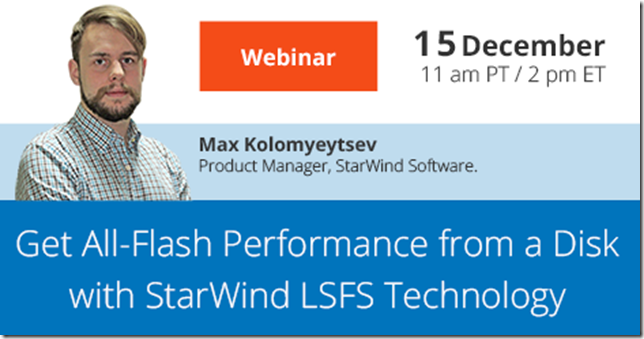 With StarWind Log-Structuring technology, you can unchain inexpensive spindle drives to achieve the performance even better than some all-flash arrays could provide. If you think it's impossible and we're exaggerating, join our webinar. We'll show how to get sky-high performance in your virtualized storage without spending a fortune.